I love that this recipe is A) Whole30 compliant (the meat, that is) B) It can be topped on a salad or stuffed inside a pita C) it’s in a slow cooker and easy as heck to make! Delicious in all forms! Low and slow is the way to go! 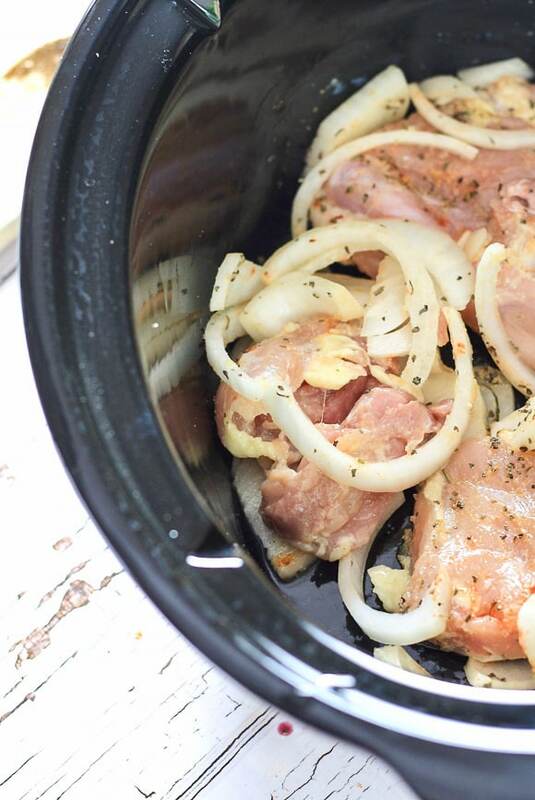 The trick to this Slow Cooker Greek Chicken is using chicken thighs. A low and slow technique makes for easy shredding, and this Slow Cooker Greek Chicken is moist as all heck. SO DELICIOUS. A simple spice mixture gets your chicken to Greek status as it mixes and melds in the slow cooker. The best part is- you can’t really go wrong with your spices in this dish. Mix and match as you prefer. Don’t like smoked paprika? Add in a pinch of chili powder for some added heat. Don’t like lemon? Leave it out. The world is your oyster! Er…slow cooker. The world is your slow cooker. Add all ingredients to a slow cooker, turn it on low, and let magic do its job. Any idea how hard it is to get a decent picture of raw meat? Do you know? It’s hard, people, okay? Bear with me- sure, my raw chicken is ugly, but once cooked- holy cow….It’s your new best friend. Once it’s done, spoon it onto your dish of choice; Inside a pita, on a plate with some veggies for a Greek style Whole30 Budha bowl (cucumber, tomato, red onion) with some red wine vinegar over it. If you’re NOT on the Whole30 lifestyle- mix up some 30 second Tzatkiki sauce as a topping to your Gyro ( 1 cup Greek plain yogurt, 2 tablespoons freshly chopped dill, 1 clove chopped garlic, 2 tablespoons lemon juice, and salt and pepper). This stuff is delicious! Easy, quick, and you can even mix it together in the yogurt cup itself! 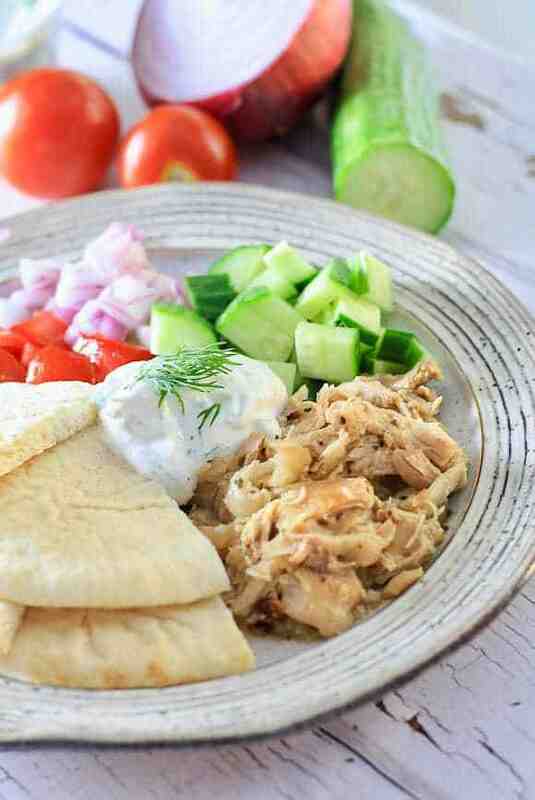 Slow Cooker Chicken Gyro Plate- Remove the pita and tzatiki if you’re on the Whole30 plan. 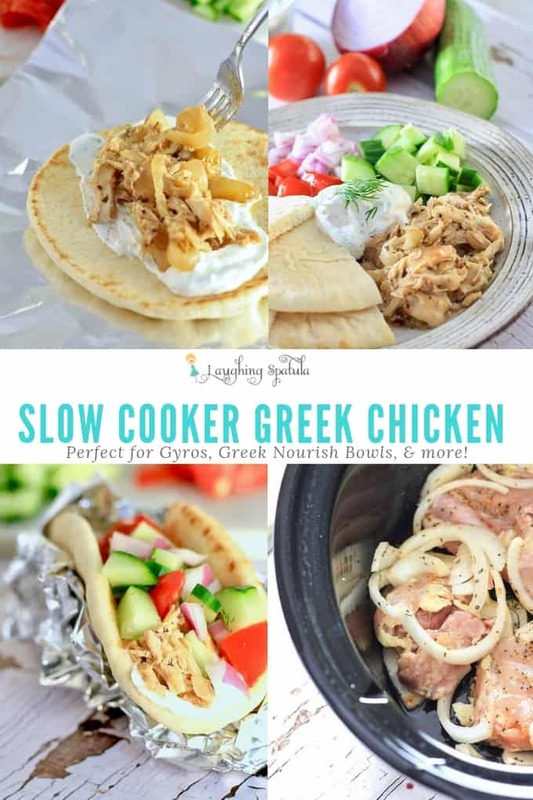 Do you love this Slow Cooker Greek Chicken? Check out our other Slow Cooker Recipes! Slow Cookers are so easy and delicious! this Slow Cooker Split Pea Soup, this Slow Cooker Classic Bolognese Sauce, or even these Slow Cooker Mashed Potatoes for the upcoming holiday season! Cheers to the upcoming Fall season for easy low and slow meals! Cheers! 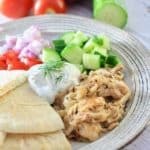 This delicious, low and slow chicken is Whole30 compliant and tastes delicious whether inside a gyro, or on a carb-free plate! Add chicken & sliced onion to slow cooker, and toss in olive oil. Add remaining dry ingredients to slow cooker, tossing until fully coated in seasonings. Cook on low for 4.5 hours, or until chicken reaches internal temperature of 165 degrees Fahrenheit. Shred with fork, and enjoy on a pita, on a salad, or whatever you chose! Enjoy! *Pairs great with Feta Cheese, Cucumbers, Red Onion, Tomatoes and Tzatiki. Want to make some Tzatiki to go with your Slow Cooker Greek Chicken? Mix up some 30 second Tzatkiki sauce as a topping to your Gyro! 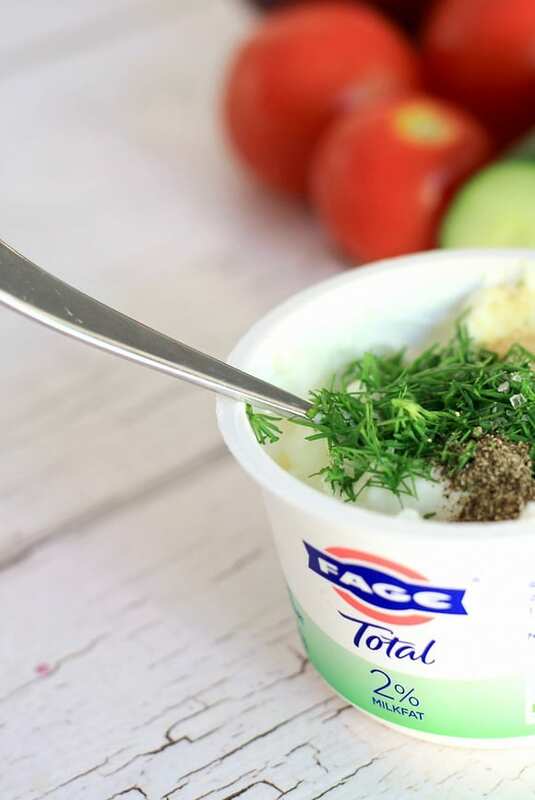 Combine 1 cup Greek plain yogurt, 2 tablespoons freshly chopped dill, 1 clove chopped garlic, 2 tablespoons lemon juice, and salt and pepper to taste. This stuff is delicious! This was so super yummy and easy!! We have 3 teen boys who now request this all the time 🙂 Amounts were perfect and love the homemade sauce – so fresh and all the veggies piled on top give great texture. This looks delicious! Quick question…is there enough liquid in this recipe? Or are the onions and lemon juice enough? Thanks! Hi GiGi! The olive oil and the lemon is enough but if you’d like more liquid, add in 1/4 to 1/2 cup of chicken stock. Delicious! I used chicken tenderloins. I shared the recipe with a friend who shared it with a friend and all 3 of us love it! This will be on repeat. 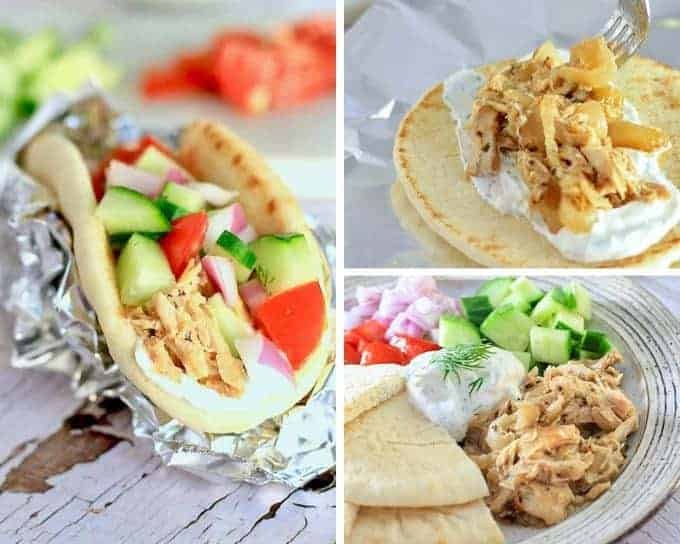 I freeze the chicken mixture and then make a gyro kind of sandwich out of it for dinner using store bought Tzatzki, a little mayo, shredded lettuce, etc. on a pita.